When it comes to coffee I’m no connoisseur or coffee snob. Above all I want a machine that’s convenient, durable and one that can make me a nice cup of coffee to kickstart my day, regardless of process. Oh, and I don’t want to pay a car’s worth of cash for it either. Let me introduce you to the coffee machine that does all of this and then some, the MoccaMaster. 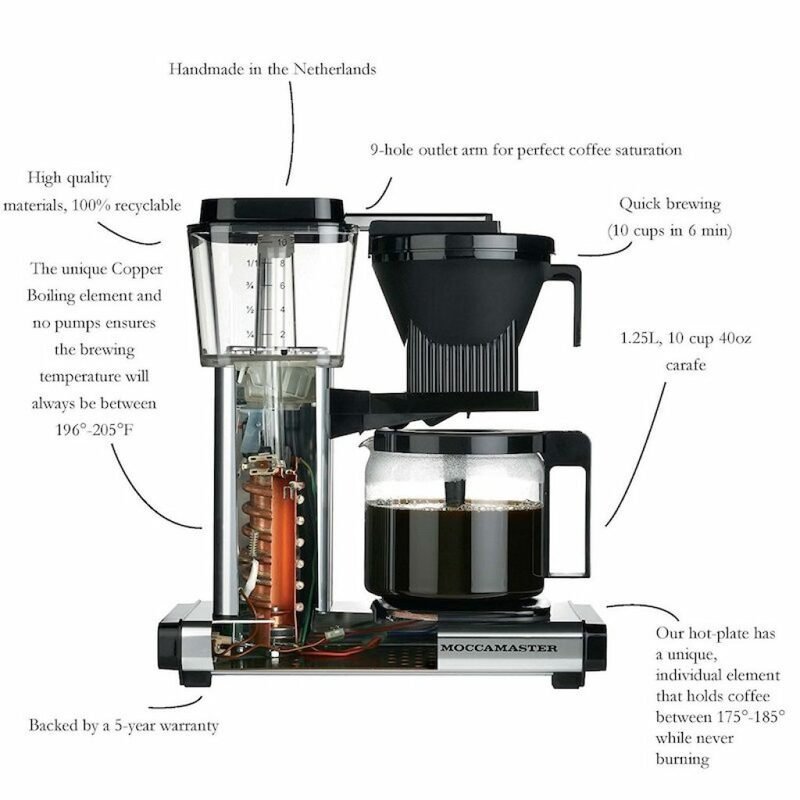 Hand-crafted in my home country The Netherlands (since 1964) Technivorm’s MoccaMaster machines have become the de facto choice for filter brewed coffee. The MoccaMasters contain a unique copper boiling element that heats water quickly to exactly the right temperature for the best coffee extraction process. Then, your coffee is kept at exactly the right temperature by the heating element. This thing is the perfect balance between having a bearded barista perform a black magic half-hour ritual and a noisy, industrial machine spitting out black liquid from a giant sack of beans. And these suckers are durable. Since each model is hand-crafted and personally tested to high standards you can actually buy a MoccaMaster for life if you take proper care of it. As someone put it, you’ll break the glass carafe before the machine dies out on you. My grandparents owned one. My parents owned one and I’m going to leave my grandchildren one if they ever decide they want to try a cup of coffee. Get the best coffee machine and don’t look back.